¨ Is when one suffer from gradual and usually permanent loss of kidney function over time. This happens gradually over time, usually month to years. ¨ Occurs when the kidney partly or completely lose their ability to carry out normal function. ¨ DEFINITION: GFR < 15 ml / min / 1.73m2, with sign and symptoms of uremia or the need for dialysis / transplant for treatment of complications of decreased GFR that increase risks of mortality and morbidity. ¨ ESRF, is administrative term in the USA, for the payment of healthcare by the Medicare ESRF program. ¨ 1 – RENAL IMPAIRMENT. GFR = > 80ml, but loss of reserve function. ¨ 2 – MILD RENAL INSUFFICIENCY. GFR = 50 – 80ml, renal mass is 25 – 50%. ¨ 3 – MODERATE RENAL INSUFFICIENCY. GFR = 30 – 50ml, renal mass is 15 – 25%. ¨ 4 – SEVER RENAL INSUFFICIENCY, GFR = 10 – 30ml, renal mass is 5 – 15%. ¨ 5 – END-STAGE RENAL FAILURE. GFR < 10ml, renal mass<5%. 1 – kidney damage with normal GFR, ( > 90 ml ). ( 60 – 89 ml ). 3 – moderate decrease in GFR, as ( 30 – 50 ml ). 4 – sever decrease in GFR, ( 15 – 29 ml ). 5 – kidney failure, GFR < 15 ml or on dialysis. It is possible to have a GFR 60 -89ml/min/1.73m2 without kidney damage. In INFANT, VEGETRIAN DIET, UNILATERAL NEPHRECTOMY, VOLUME DEPLETION, HEART FAILURE. ¨ 1 – Congenital abnormalities. ¨ 2 – Hereditary condition. ¨ 4 – Multisystem disease. ¨ a 13 years-old girl presented with increasing fatigue, anorexia, weight loss, and sever pallority. She also had a history of polyuria, polydipsia, since infancy, and enuresis, nocturia. Her family history was unremarkable. ¨ Serum Creatinine was markedly elevated, and urinalysis showed a low SG, with mild proteinuria and glycosuria. US showed small echogenic kidneys with multiple small cortico- medullary cysts. 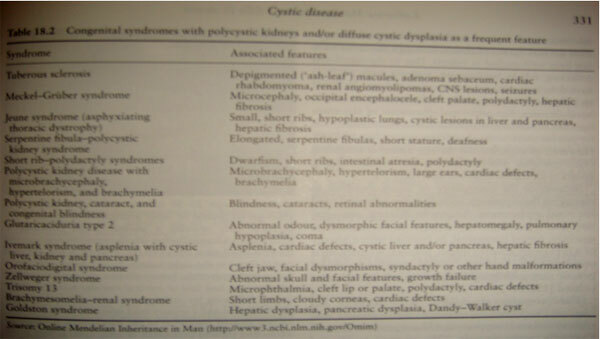 ¨ 1 – CYSTIC DISEASE: ARPCK. ¨ Renal cystic disorders represent a heterogeneous group of diseases which may present in utero or be clinically silent well into adulthood. ¨ The age of presentation, family history, and other clinical signs and symptoms are essential in delineating specific disease entities. ¨ Cystic disorders include: ARPCK, ADPCK, GCKD, diffuse cystic dysplasia, simple cyst, MCD/JNPH, and ACKD(acquired). 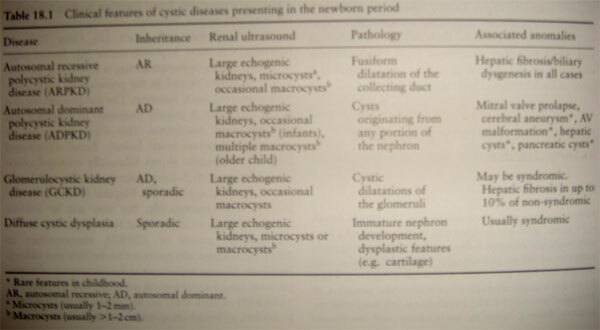 ¨ Cystic kidneys are an important component of several congenital syndrome. ¨ ARPCK: autosomal recessive PCK. ¨ This presentation of a neonate with oligohydramnios, respiratory distress, large echogenic kidneys, and HTN. Renal function is normal in in the neonatal period. ¨ Hepatic fibrosis is invariably present histologically, (abnormality are classically restricted to the liver and kidney, and occasionally multiple intracranial aneurysms in the adults). ¨ ADPCK: autosomal dominant PCK. ¨ The presentation is from neonate to adulthood. ¨ Symptoms include hematuria, HTN, flank pain, UTI and sterile pyuria. ¨ US demonstrates one or more macroscopic cysts. ¨ ADPCK is a systemic disease, with multiorgan system involvement. Intracranial aneurysms, mitral valve prolapse, liver and pancreatic cyst, ovarian cysts, intestinal diverticuli, and hernias may also develop. ¨ ADPCK is responsible for 8 – 10% of cases of ESRF in Europe. ¨ Glomerulocystic Kidney Disease: typically present in the neonatal period, with large echogenic kidneys and microscopic glomerular cysts. ¨ SIMPLE CYSTS: is age dependent, and occurring < 1% in children. ¨ DIFFUSE CYSTIC DYSPLASIA: occurs primarily as a sporadic condition, or as a part of multiple malformation syndromes. In the cysts is primitive elements such as cartilage. ¨ Acquired Cystic Kidney Disease: occurs in ESRF, that are on dialysis. And kidney is enlarged. ¨ as a distinct clinicopathologic entity of inherited diseases that lead to CRF, due to chronic sclerosing TINephropathy. ( cystic formation, tubular atrophy, tubular basement membrane disintegration, interstitial fibrosis). ¨ NPHP is an aut. rec. disease with onset of ESRF in adolescence, and is the most frequent genetic cause of CRF in first two decades of life ( 10 – 20% of all cases ). ¨ MCKD is used for aut. dom. Variants with onset in adulthood. ¨ NPHP/MCKD, divided as INFANTILE, JUVENILE, and ADOLESCENT, forms. ¨ INFANTILE NPHP: NPHP2, in which ESRF, occurs within the first 3 years of life. It has enlarged kidneys and cortical micro cysts, absence of medullary cysts. Gene locus was localized to 9q22-q31. (is same as ARPCK). ¨ JUVENILE NPHP: NPHP1, a gene locus has been mapped to chromosome 2q12.3 (NPHP1). Some of patients has extra-renal manifestation. ¨ ADOLESCENT NPHP: NPHP3, has been localized to chromosome 3q21-q22. ¨ The disease genes for NPHP4 – 8 has been identified. ¨ The proteins for which they encoded are known, as the NEPHROCYSTINS, that localized at least in part to an organelle in the cell called the primary CILIA. ¨ This diseases characterized by the insidious onset of renal failure. ¨ In recessive NPHP, symptoms of polyuria, polydipsia, decrease urinary concentrating ability, 2nd enuresis, are the earliest presenting symptoms in more than 80% of cases, and occur at 4 – 6 years of age. ¨ Starting to regularly drink at night at 6 – 10 years old. ¨ Pallor, weakness, and pruritus are common. ¨ Anemia and growth retardation occur latter and are usually pronounced. ¨ Median age for ESRF is 13 years. 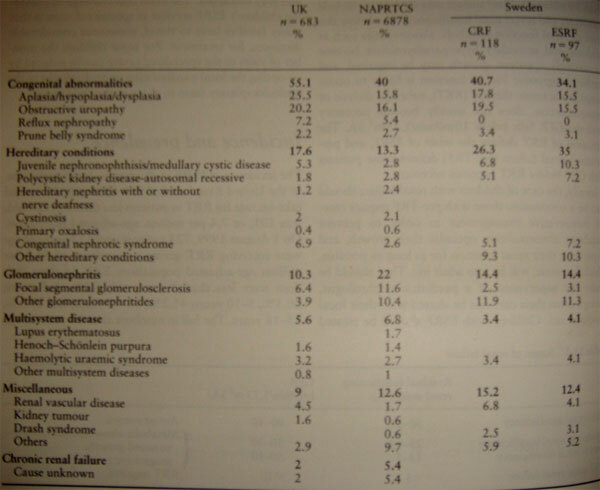 ¨ Typically, edema, hematuria, and UTI are absent in NPHP. ¨ HTN is rare ( for degree of CRF ). ¨ Most children have already develop CRF when the first come to clinical attention. ¨ They have definite risk of sudden death from fluid and electrolyte imbalance (rare). ¨ If RF has not developed by the age 25, the diagnosis of rec. NPHP should be questioned. ¨ Disease recurrence has never been reported after renal transplantation. ¨ EXTRA-RENAL manifestation, occur only in recessive NPHP, but is absent from MCKD. ¨ as increase serum Creatinine value in patients with nonspecific complaints. ¨ Prolonged nocturia since school age. ¨ Low early morning urine SG. ¨ Small to normal size and echogenic kidneys. ¨ Confirmed by molecular genetic diagnosis in NPHP. ¨ Ophthalmoscopy should be performed. ¨ Liver function tests and hepatic US, are important. ¨ Kidney US, or MRI. For detection of renal cysts. ¨ Kidney biopsy is not initial procedure (due to PCR). ¨ There is no specific therapy. ¨ All patients develop ESRF in first 2 decades.